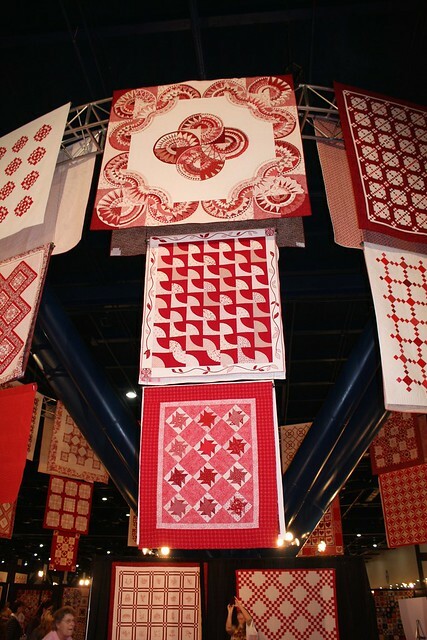 I took a lot of photos of quilts that were interesting to me in one way or another. 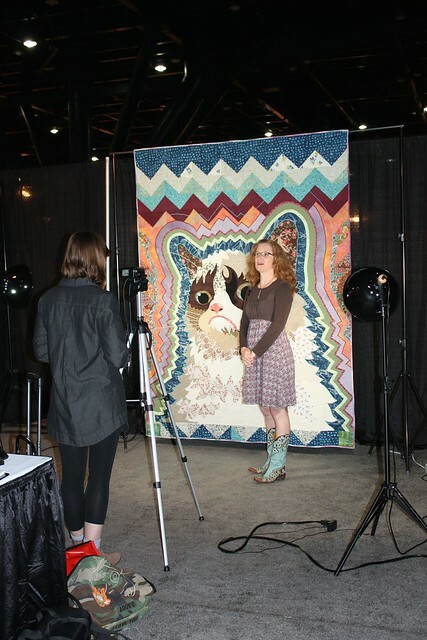 They are not particularly good photos, so part of me feels like I am doing a disservice to the makers of those quilts. On the other hand, I know that those who can’t make it to a particular show often enjoy seeing even a part of it vicariously through those who did go. I know that I’m often that person. 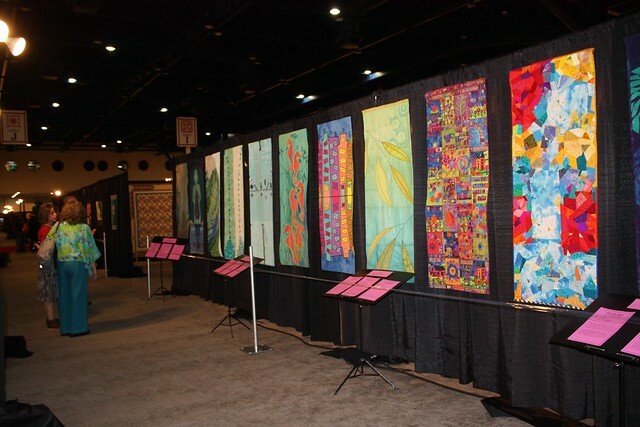 So, here’s a completely subjective, not at all cohesive or inclusive, handful of quilts that I enjoyed seeing at the Quilt Festival in Houston. The big draw is IQF’s annual World of Beauty show. It’s the one with the big prizes and about a million categories. The big prize winners were impressive as always and can be seen on IQF’s website. Overall, I tended to like the second place winners best. Growth by Maria Elkins. I just loved the ovoid shapes and the way the colors gradate from pastel to jewel and the background from dark grey to white. It’s a refreshing change from the currently popular rainbow method of organizing color. I don’t remember which category this was in. GMOs Gone Wild by Betsy Brandt-Kreutz in the Art-Abstract, Small, category attracted me with it’s wild milifiori look. We decided that it was definitely a commitment to a look, and I have to respect that conviction. This may have been in the Embellished category. I like that too — embellished but without the usual glitz. Eight Branchlets by Janet Steadman. I think this was in the Art Quilt, small, category. I really liked the crafts(wo)manship on this. Also, it’s just plain lovely. I found The Messenger by Marlene Shae in the Whimsical category to be utterly enchanting. I love the somewhat folkloric style of the illustration and the fabric choices. 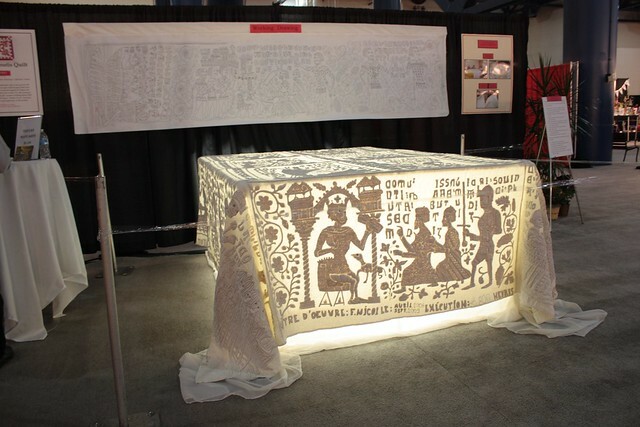 I’d love to see an entire book illustrated with quilts like this. Shared Destiny by Patricia Kennedy-Zafred was my favorite in the digital imagery category. There were a few variations on this multiple versions of a single image theme, but I think one was done the best. I appreciate that the ground fabric is patterned and I like the insertion of contrasting fabrics within each image as well as the addition of Flying Geese motifs. Towers and Spires by Paula Tanner used miles of satin stitch in an interesting way. This also may have been in the Embellished category. Hudson Trader by Coleen Wise. You can’t go wrong with blue and white. I like how this one seems pretty traditional and basic at first glance, but then you notice the illusion of the spheres and the subtle changes in their size and it just becomes sublime. Well, to me at least. 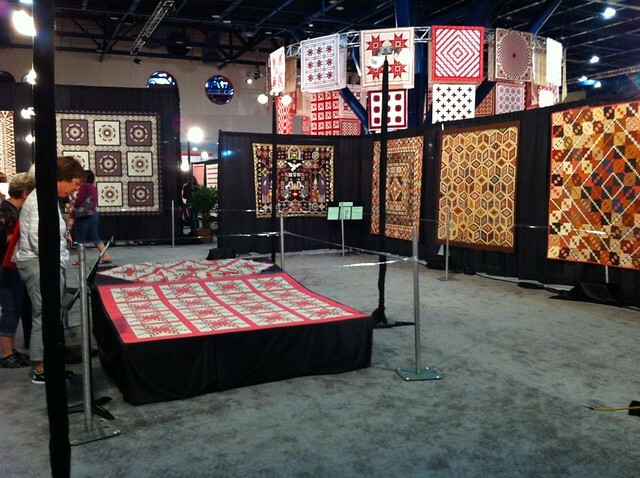 Somewhat, but not too surprisingly, I absolutely loved the exhibit of 500 Traditional Quilts. There was no photography allowed, so I have nothing to share. There is wonderful, inspiring, and varied work in the collection though so I may have to buy the catalog (along with the catalog for the Walsh collection we saw at the Quilt Museum in La Grange). Another special exhibit that is always a favorite of mine is Tactile Architecture. Rooflines #8 by Colleen Kole is to me a perfect combination of quiltiness and implied imagery. 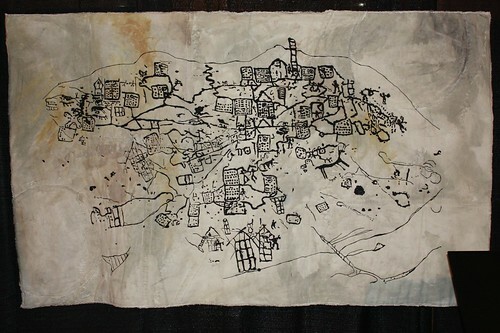 It’s also influenced by both the quilts of Gee’s Bend and Nancy Crow/Lisa Call, but too derivative. No surprise that her other entry, Rooflines #2, appealed to me too. This one is more derivative of the School of Nancy Crow/Lisa Call, but appropriate and well executed and therefore no less appealing to me. And for something completely different, I loved the stitchiness of Bedolina Threads by Maggie Vanderweit. The Farm to Table special exhibit was also predominantly Modern in it’s aesthetic. I just loved The Pursuit of Happiness by Robin Felton for it’s bold simplicity and nod to both furrows and flag. Finally, these cheerful mola-style dogs kept jumping out at me from the It’s Raining Cats and Dogs exhibit.